Exhibition 9th-14th February, at Centrespace Gallery, Bristol. JH Why do photographers choose to study on MA Graphic Arts, and what could looking at one subject through the eyes of another tell us about the current condition of photography? SM The fact that we have photographers choosing the course is not that unusual, as photography has always been part of the graphic arts. Having them locating their practice within broader debates and contexts may be more significant at this time. Our philosophy is to market the course around our students, and provide platforms for them to do and say things. This is one of the reasons we are curating this show at Centrespace. JH Do you see the practice of photography becoming more inter-disciplinary? SM I see the over use of the term ‘inter-disciplinary’ as being problematic. At undergraduate level a student should learn their subject. 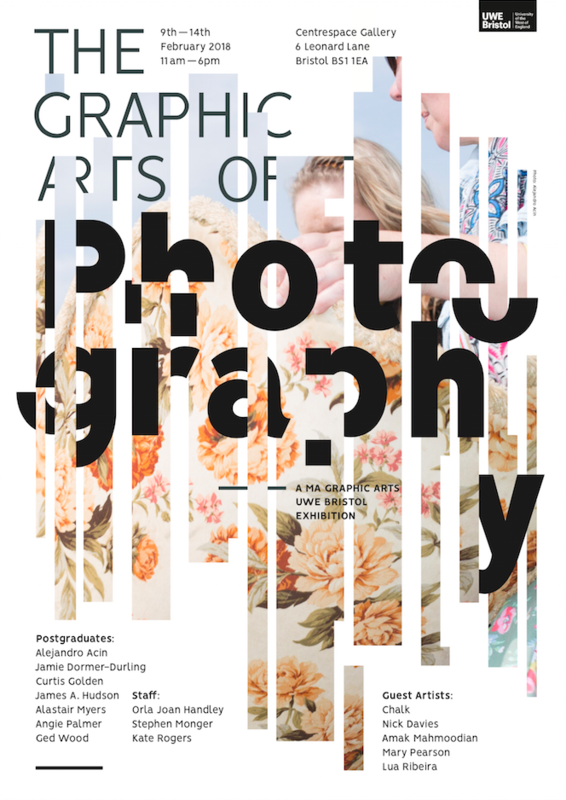 At postgraduate there is a lot to be gained from engaging with other creative practices. Digitisation has opened up many of these debates, however those individuals that fail to align themselves to a discipline struggle to gain the depth of understanding that is required. Being on a course like this gives you a good understanding about where photography fits within the graphic arts, and how you could make it fit somewhere completely new. We teach contemporary and craft skills together as part of a critical approach to the graphic arts. Communication and the photographic language is definitely our territory. AA Yes, we cannot forget that photography was always a versatile communication tool. As a late comer, photography had to fight a tough battle in terms of being considered an art form. Thankfully, we are over it. This battle brought a lot of good things to its research and understanding as a discipline. JH …and when you say you are a photographer doing this course, and they ask ‘What sort of workshops are you doing?’ and you say ‘Letterpress’. There is shock and I sense, jealousy. SM Photographers are interested in text. They can make good graphic designers too. They have skills, come at things slightly differently, and have great attention to detail. SM …those marks take us back to the activity, the chiselling, the working with materials. I want to talk about photography’s link with other practices. We get photographers that want to be in front of the camera as well as behind it. They want to make, stage or arrange things. JH For someone like Richard Long, all our experience of his work has come about through photographs. Hardly any of us have seen the works. SM He’s very interested in words as well, and is a good example of someone that mixes the plastic and the graphic. We are also showing the work of Chalk in this exhibition. He’s a painter, and following a stroke turned to photography. He brings some of the concerns of painting to photography. The sort of pictures he makes don’t look like they are made by a photographer, and I know he won’t mind me saying that. There is something to be learnt from one discipline talking to another. AA Jason Fulford (2) says that there are two types of photographers, the collectors and the sculptors. Collectors are those interested in the capacities of photography to depict reality. The sculptors are those who arrange the reality in order to be photographed. This is not a defined line of course… I like that simple differentiation though, because it can help us talk about the complexity of the word ‘graphic’ in photography. On one hand, photographs that are considered ‘graphic’ have distinct curves and lines, colour contrast and highlight geometry within a particular scene, such as Lilian Bassman or Mario Giacomelli, and on the other, they can be seen as ‘graphic’ through their function, like images of explicit violence for example. JDD I went to the National Portrait Gallery in London recently with my students… and I was trying to explain to them that every part of a painting they see, the brush has run over. It is there with intent. Then we got the students to grid some of their photographs and we asked, ‘Which squares contain intent?’ Now we are going through an exercise getting them to intend every square. SM For a photographer, intent is about giving permission to be there. There are those photographers that are also interested in drawing. Cartier-Bresson drew and I think Jeff Wall taught drawing amongst other things. The link between drawing, lenses, camera obscurers has always been there, but that coupling, or that understanding, is no longer part of photography education. We only see with our eyes now, not through drawing. AA I prefer the word ‘consciousness’ in order to talk about a photographer’s intent. I think of photography as an extension of our cognitive process of perceiving reality. JDD …and why is that tactility important? JH For some photographers it isn’t. If you want to make an image, you can, and nothing is going to stop you. It will be super high-definition, and it can be done very quickly and published around the world. Tactility doesn’t come into it. SM I was thinking about some of these different terms for photography. We’ve had Re-Photography, Slow Photography and Late Photography (3) – the idea that photography shouldn’t be so quick and has a different role to do. JH …this idea of slowness offers a definition. For me the graphic arts of photography is certainly slower. It’s always slower. AA In education, there is still a lot of emphasis on photographers only being image makers. That idea is losing weight and as ‘professionals of the image’ we should encourage students to think of context and audience as a creative process. The understanding of this is very diverse in the graphic arts. This could be one of the reasons I chose to do this course. Sometimes in photography we have a tunnel vision, we can only do a book, exhibition or multi-media, and it is difficult to challenge process and media. SM I am trying to think about photographers that have co-opted or bent the photographic medium to their needs, those that have demanded more from the medium and could be seen to have embraced the graphic arts. Historically people like Man Ray, and Alexander Rodchenko in the 1920s, Hannah Hoch… Richard Prince, Mari Mahr in the 1980s, the abstract colour of Garry Fabian Miller, John Stezaker more recently …and those collaged stitched portraits by Annegret Soltau. These individuals changed our view of what photography can be. The camera, the surface of a photograph is a beautiful thing, but they are not sacred. JDD …Do you fight against it? JH No you can’t. That is the world, you would be up against a steamroller. Things have changed. JH …I think what the tutors would say is they are helping their students communicate their ideas, but they are not doing communication design. You don’t go anywhere near ink or anything that is dirty. You generally don’t interfere with the image. SM Interfering is a useful word. AA I was going to say something similar. I went to a Festival of Ideas talk in Bristol recently. The title was ‘Dealing with the Past in the City’, and the designer (whom I’m struggling to recall his name) was talking about new ways of building memorials. He said it does not have to be an object, but it can be something that interferes. He mentioned a memorial proposal for Berlin that you do not see, but you hear when you drive over it. In photography I think sometimes we lack that. What is the point of making a book when everyone is doing Instagram stories, when the act of communication is much more fluid? Don’t get me wrong, I love making books, their intimacy, their slowness… but it seems that we are missing something if our aim is reaching a broader audience. I think of people like the Argentinian artist Amalia Ulman that questions our understanding of photographic clichés. They tend to be those who use performative approaches, but is it not the case that all photography is a performance? SM It seems to me that some of these anxieties about communication have always been there. I was reading about John Baldessari’s decision to stop painting. He described painting as talking in another language, like Sanskrit in a world that spoke English, (4) and he wanted to talk to more people. I think with digitisation; language becomes a lot more nuanced. This is where an understanding of the graphic arts become more vital. AA Many photographers still see text as a non-graphic element that does not interfere with an image. The minute you acknowledge that graphic relationship, you can embrace it and use it with photography. SM In the world of data, an outlier can be seen as an unexplained entry, or something that doesn’t conform to the hypothesis. In creativity the outlier is a source of intrigue, possibility, or challenge. The non-conformity is there to be used. Photography, just like all subjects, needs to have outliers. To interfere in a medium is healthy and the ideas of outliers can, and often do, move to the centre ground. 2 Jason Fulford 2017, in a talk at Gazebook Photobook Festival, Punta, Secca, Italy. 3 See David Campany’s essay ‘Safety in Numbness. Some Remarks on the Problems of Late Photography.’ in Green D (Ed) 2003, Where is the Photograph? Photoforum and Photowork. 4 Joan Fontcuberta, 2014, Pandora’s Camera: Photography After Photography, Mack, p.186.